There’s no place in the Prescott area that brings nature together in harmony with a community, like Enchanted Canyon. Spacious living among bolder outcroppings, hiking trails, and preserved Indian petroglyphs create the perfect setting to build your dream. Don’t have a builder? No problem. We’ve hand picked some of Prescott’s top contractors who can work closely with you to create the right home, in the right place, no matter what your vision. Imagine all of this with Mother Nature as your neighbor, yet with a variety of design choices and big city services. Welcome to your new neighborhood. Enchanted Canyon features relaxing views of Thumb Butte, Granite Mountain, and the San Francisco Peaks. With lots starting at $150,000, pad ready building sites, and new homes currently under construction, we have what you’re looking for. Come tour our model home to see all that Enchanted Canyon has to offer. 1390 Ridgewood Drive. Open Daily. CONTEMPORARY FARM HOUSE DESIGN BUILT ON A LARGE CUSTOM LOT. NATURAL AND PERMANENT OPEN SPACE ADJACENT. By Design Builders LLC and Adorn Interior Designs LLC have collaborated another beautiful custom home on Lot 15 in Enchanted Canyon. The home features the Master Suite with soaking tub and shower, large custom design closet and access out to the back patio. The Guest Suite includes a full bath for those extended stay guests and family. The Office/Den also includes a walk-in closet and can be used as a third bedroom. The Great Room can accommodate a Formal Dining Room or additional sitting area adjacent to the Kitchen and Breakfast Nook. This area also opens to the back patio that includes a private yard area with large boulder outcroppings and a fire pit. Also included is a large Pantry, Powder Room and Laundry. A livable area of 2793 sq.ft are included in this home with a 2+ car garage. 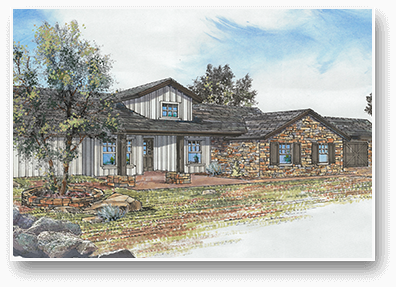 By Design Builders and Adorn Interiors have selected Lot 37 at Enchanted Canyon for another Design Build Home, capturing all of the unique elements of this lot. 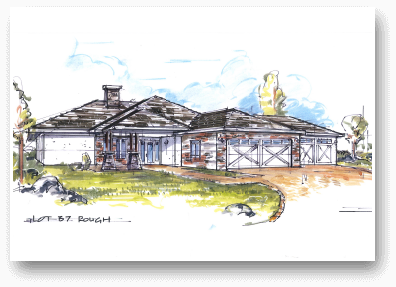 The design offers a three car garage which enters the home through a mud room and large pantry into the Kitchen. The Kitchen has a large island with fabulous cabinet layout and is part of the open living space including the Dining Room and Great Room with Fireplace. This home provides a Master Suite with a spacious closet, double sinks and a large wet area that includes a soaking tub and separate shower area. There is an in home Library/Office, guest bedroom with attached bathroom and a fourth bedroom that can be utilized as a multi-purpose room if needed. The home is accented by a front courtyard with Fire Pit which is protected and buffered by a Natural Stone stacked wall and paver patio. The rear patio sits adjacent to an oversized backyard perfect for fencing in the family pets. All finishes have been selected by Melanie Davis and Adorn Interiors. The Davis Group provides a complete range of specialized services for today’s diverse real estate clientele. Our team was carefully selected for their ultimate knowledge and success in specific areas of the market.